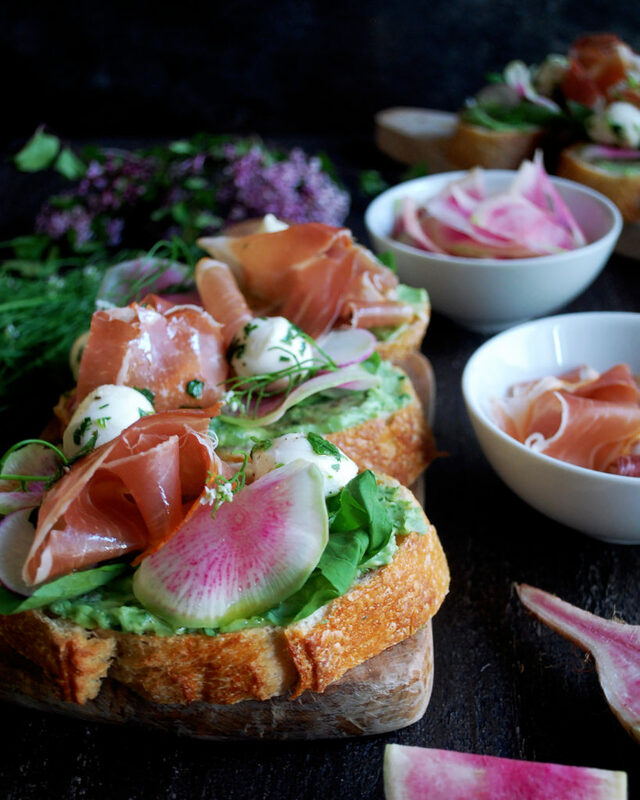 In classical French cuisine, radishes are served with fresh butter and sea salt as a snack or light appetizer. I think the simplicity is what makes this dish (radis en beurre, in French) so endearing. While working at Bouchon, we ran it as a special one week. I had never seen the dish before, and was shocked that it truly was just as simple as the name implies. We took whole radishes, dipped them in softened butter, and sprinkled a pinch of fleur de sel onto each one. The crunchy, astringent radish mixed with the creamy, sweet butter was just perfect. And you definitely need the salt to bring out all the flavor, which for two ingredients there definitely is a lot. 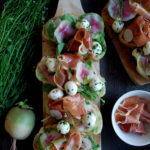 This tartine has a bit more going on ingredient-wise, mainly because I had prosciutto and fresh mozzarella on hand, but it still touches on that radish and butter combination. I use a nice sourdough bread, toast it slightly, and then quite literally just layer all the ingredients on top. 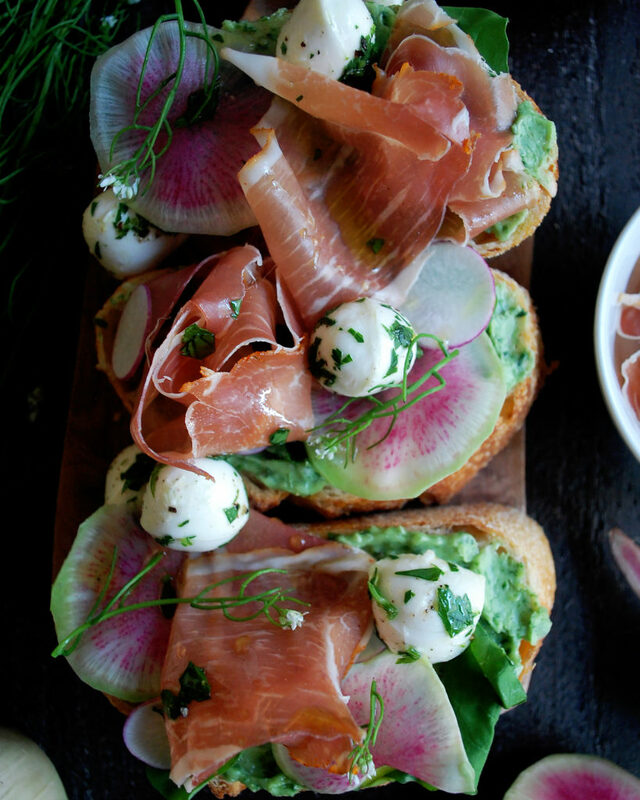 It’s delicious, especially when you need an appetizer that comes together in no time. Here I’m using some softened ramp butter that I made a few weeks ago for this Sweet Pea Agnolotti dish. Feel free to substitute grilled green onions or even just fresh herbs for the ramps in the recipe. You can also simply use regular butter, which is exactly how the French dish was intended to be made. Enjoy! Preheat the oven to 400F. Slice the loaf of bread into 8 thick slices. Toast the bread in the oven until slightly crisp, but still soft on the inside. In a small bowl, toss the fresh mozzarella, parsley, and olive oil together. Season with salt. Let marinate for 20 minutes. To assemble, spread your desired amount of ramp butter onto each slice of bread. Sprinkle a pinch of fleur de sel onto the butter. Place a small mound of watercress on top. 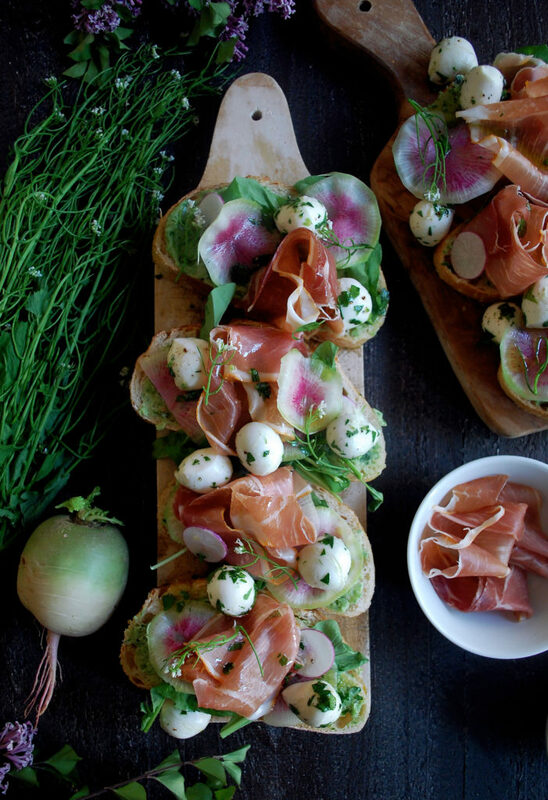 Arrange the prosciutto onto the toast, along with a spoonful of marinated fresh mozzarella. 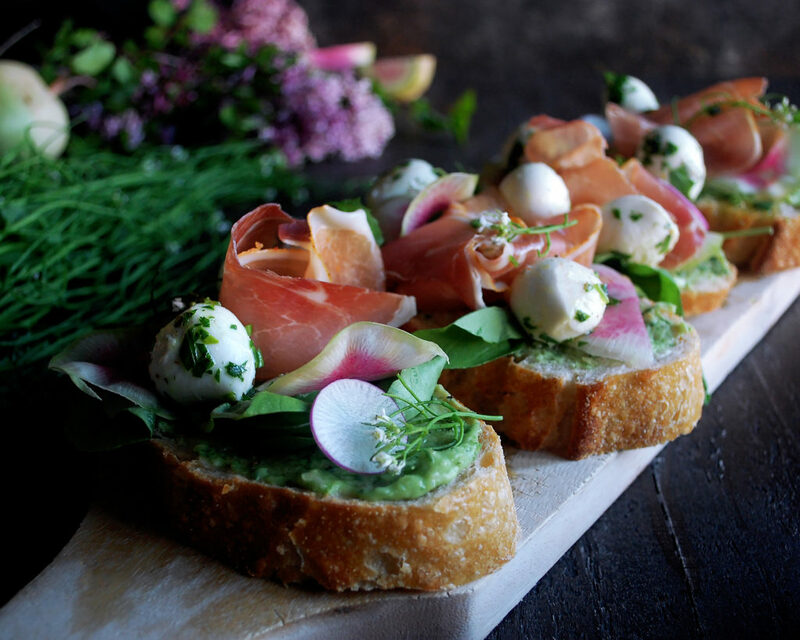 Garnish with the shaved radishes and basil flowers. Season with more sea salt, if needed.